Should you mention Walter Kirn and Robin Sloan in the same breath? Well, I just did. You see, I hate book trailers. Just on general principles. The only thing worse is listening to a writer read a portion out loud. Walter Kirn’s publisher commanded him to take some steps to promote his latest book — Blood Will Out: The True Story of a Murder, a Mystery, and a Masquerade – on Twitter (which I also deplore but can ignore), Facebook (which I adore and can’t ignore), and the ever-hated book trailer. So Kirn uploaded a video to YouTube as an open letter to Little Failure Gary Shteyngart, which I shared on my Facebook. My Facebook friends obviously weren’t as entertained as I. The photos I upload to Facebook revealing the lettuce and tomatoes I’ve harvested from my garden generate more comment. Only Frank Koughan (Cringeworthy! 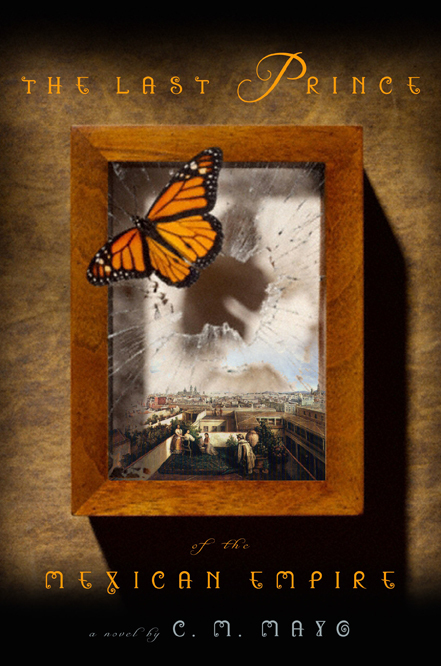 ), an Emmy Award-winning writer and producer, chairman and executive editor of Burro Hall Enterprises, S.A, living in Queretaro, and David Leffler (That was great! The Ryan Gosling thing at the end was hilarious, but a little sad because there is some truth there. ), a New York City lawyer and bon vivant who spent a decade penning columns about practicing law in a magazine I once edited took the time to comment. The only like came from Don Coulter, a Guanajuatense by adoption and Mexican by naturalization, Minnesota-reared, and former managing editor of AMI Auto World. Even the Facebook friends who like everything I post didn’t like this video. That’s probably more a commentary about my Facebook friends than the content of the video. Pondering for a moment who R. Sloan was, I ripped open the letter. And I instantly realized who it came from. 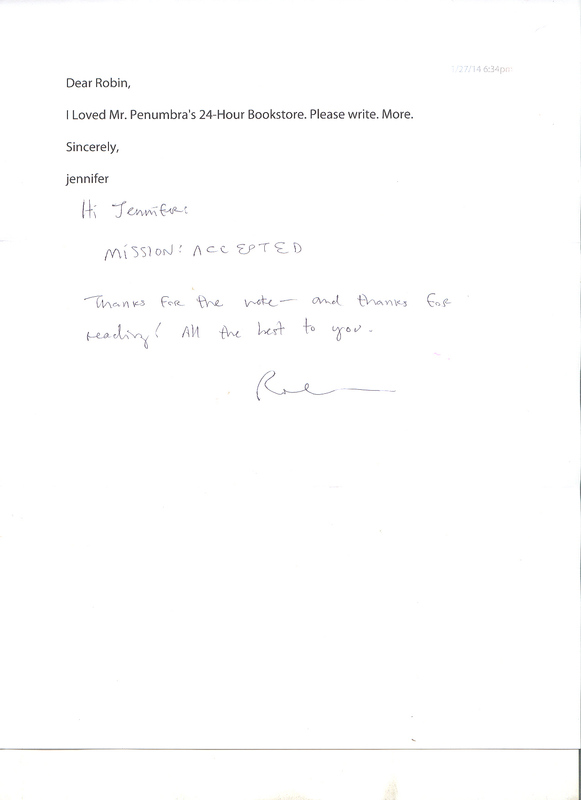 Robin Sloan, who thoughtfully sends me e-mail from time to time, because I’m a fan of his book Mr. Penumbra’s 24-Hour Bookstore: A Novel, but more likely because I’m on his mailing list. And it was his mailing list e-mail that invited me to go to his website and write him a letter, promising me one in return. The handwritten reply will be neatly folded, put back into its envelope, and inserted into my first edition (as if those are worth anything these days) of Mr. Penumbra’s 24-Hour Bookstore with its glow-in-the-dark cover. That doesn’t make it a signed first edition, but it’s a lot easier than sitting politely through remarks and standing in line at some author event. And even more so since I’ve never go to one in the first place, never mind that pigs will fly before any would be scheduled within driving distance of where I live. Nearly a generation separates Kirn and Sloan, but the divide is greater than that. Kirn studied English at Princeton, and Sloan majored in economics at Michigan State. Kirn lives in Montana, and Sloan lives between California and the Internet. Kirn has hair, and Sloan doesn’t. But the real divide is digital. Sloan sought and got funding from Kickstarter. Kirn’s still old school, and Sloan’s a media boy. But that quaint old-fashioned touch of asking the U.S. Postal Service to deliver a reader something in the mail trumps everything. It’s almost something that Mr. Penumbra might do. Now, I’ve bought every book Walter Kirn’s ever written, and some more than once. And I loved his video. I’ve only bought one of Robin Sloan’s books, but that’s because he’s only got one out in print, and I only buy print editions. All the book trailers in the world aren’t going to entice me to buy, but a hand-written letter will keep the sender on my radar for a long time. He was Mexico’s mirror image of Tom Wolfe. And he was the most important Mexican writer most Estadounidenses never heard of. If you’re one of them, read Mexican Postcards. It’s an essential step toward knowing Mexico and understanding its culture.